Pass It On, 2013, Nicola Anthony. 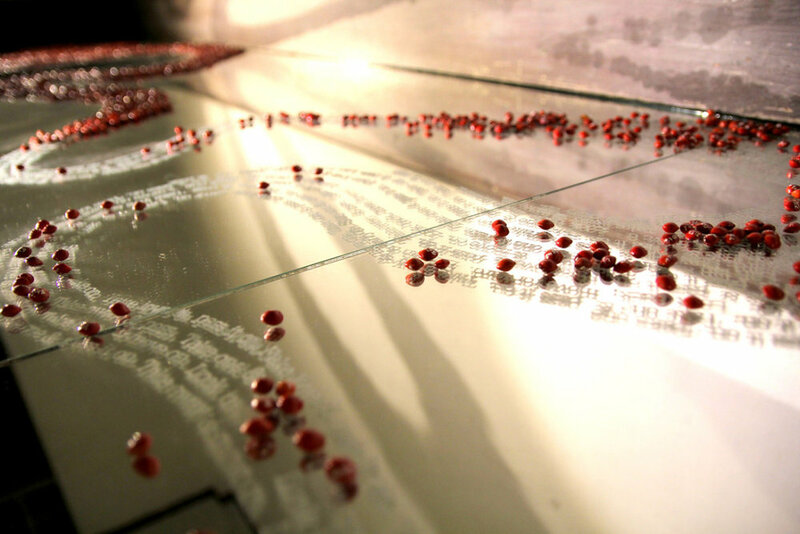 8900 saga seeds, white pigment ink, text on glass mirror, stories. 457cm x 80cm. 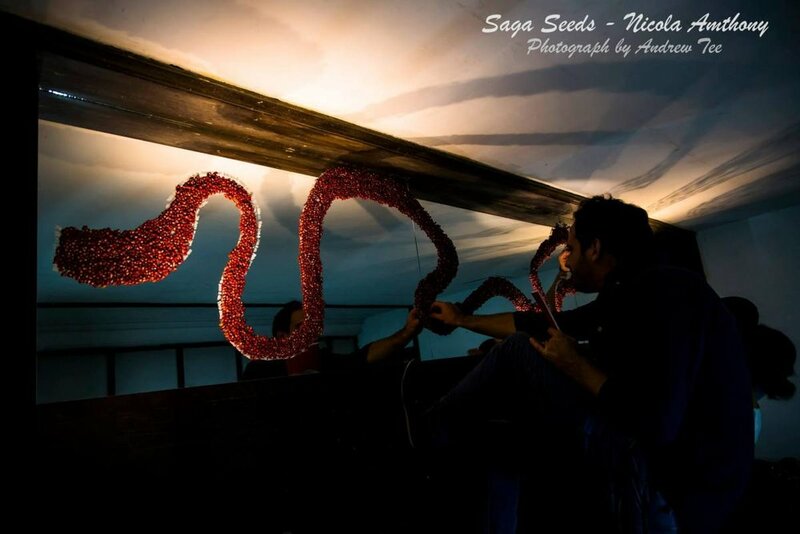 Nicola Anthony's 8,900 saga seeds installation artwork Pass It On will be exhibiting in 'Displacements'. "Displacements is an art exhibition/festival at a soon to be torn down 77 year-old pre-war bungalow (after being sold to a developer) in the Mt Sophia area. The exhibition will showcases artists debuting newly-commissioned work across a range of media (painting, ceramics, photography, installation, performance, sound art).This interactive community art space will interpret the theme of displacement in all its various forms (geographical, temporal, cultural etc.) and speak to the Singapore’s changing urban landscape and population demographic. There will be dance performances, film screenings and lots more, followed by a closing party." Art Reborn on A-OK (Arts on OKTO) features the artworks and exhibition space at the Displacements exhibition, and interviews exhibiting artist Nicola Anthony. 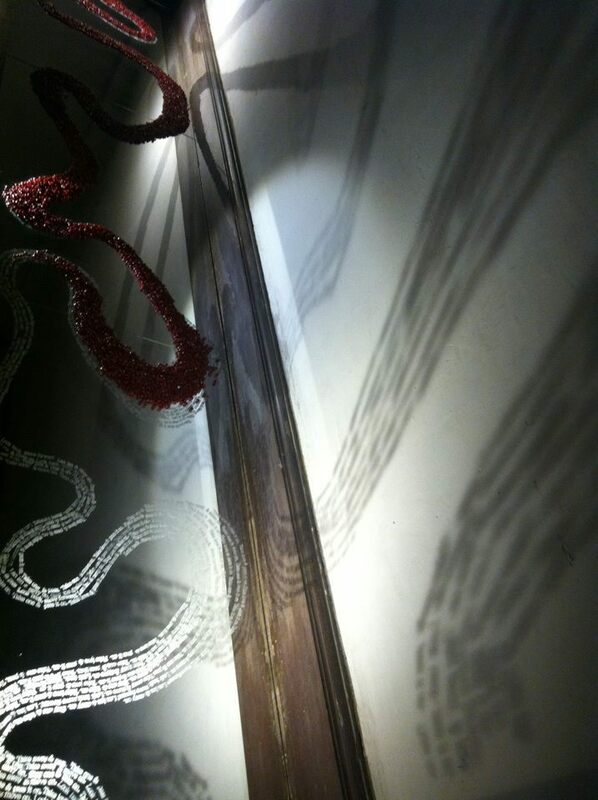 In Pass It On, 8,900 seeds compose a meandering line, based on river formations. This line of red particles traverse the gallery space atop a mirrored floor which throws waves of light and shadow into the space.